French Ring Sport is a dog sport involving jumping, obedience (breaking in exercises), and bite work. It is most similar to Belgian Ring, Campagne and KNPV, but also shares common elements with Schutzhund and Mondioring. French Ring Sport rules are set by Groupe Travail Ring under the mandate of Commission D'utilisation Nationale Chiens de Berger et de Garde, a committee run under the patronage of the Société Centrale Canine. To participate in French Ring Sport, a dog must first pass the Certificat de Sociabilité et d’Aptitude à l’Utilisation (Certificate of Sociability and Aptitude for Work) temperament test. French Ring Sport defines three earned levels, after earning a Brevet (Certificate) for dogs of defense: Ring I, Ring II and Ring III. Each introduces progressively more difficult situations and makes greater demands on the dog . The trial is divided into three sections: jumps, obedience (breaking in exercises), and protection. Obedience is emphasized in all three sections. When competing in Ring, the dog has no collar or leash on anytime except while being asked to heel on leash. No food rewards or physical corrections are allowed at anytime while competing. Also, excessive praise or petting will result in a loss of general outlook points. Points for an exercise will be lost for multiple commands, incorrect commands, or failure of the dog or handler to perform the exercise correctly. 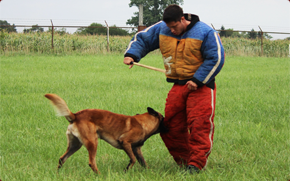 Control is emphasized from the moment the dog/handler team walks onto the field, until they leave at the end.